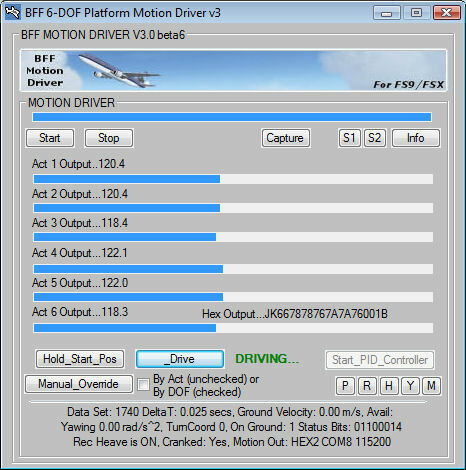 The BFF Motion Driver generates real-time digital position demand signals to drive the movements of a flight (or racing) simulator motion platform. 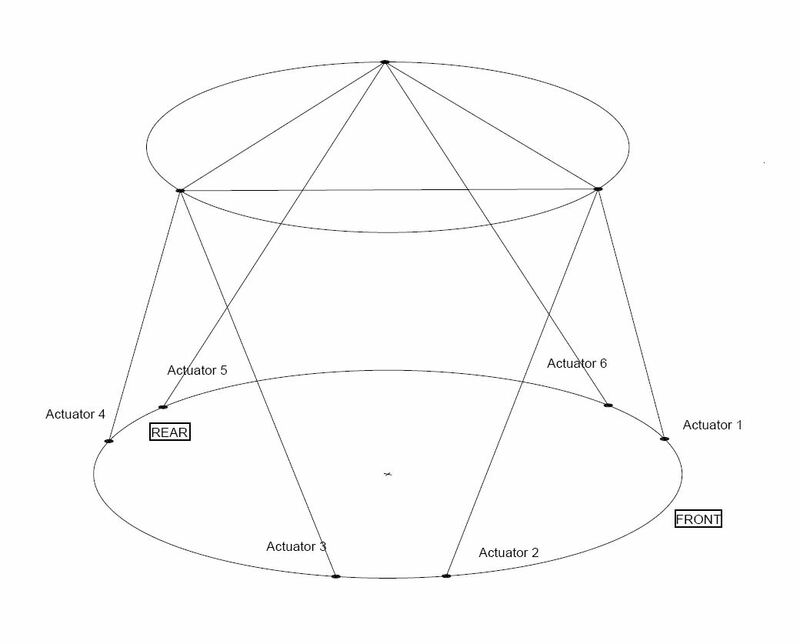 V3 of the Motion Driver generates motion cues for 6 degrees of freedom (6 DOF) hexapod (Stewart) type platforms. The V3 motion driver works with Microsoft Flight Sims FS9/X, X-Plane v9.5+, Aerowinx PSX and Condor Soaring. Beta versions are also available for rFactor, Assetto Corsa, F1 2013, Live for Speed and iRacing racing sims plus others. Each Sim has a separate motion driver .exe. A "Generic" version is also available which is not related to any specific flight or racing sim but can be driven by vehicle motion data sent by UDP. The motion driver assumes all six platform actuators are identical in stroke length and position feedback calibration. The position feedback should be +ve for upwards heave of the platform. The actuator numbering is as shown in the figure below. Actuators 1/2, 3/4 and 5/6 form the three pairs. To work with platforms with reversed fore/aft and lateral directions simply reverse the pitch, surge, roll and sway cues in the .bff configuration file using the reverse sense parameters (see the M settings window). The actuator working ranges are defined in the config file using a scale of 0-255 and the position demand for each actuator is output as a value within the 0-255 range (for 8bit output formats). Higher resolution outputs are also available. 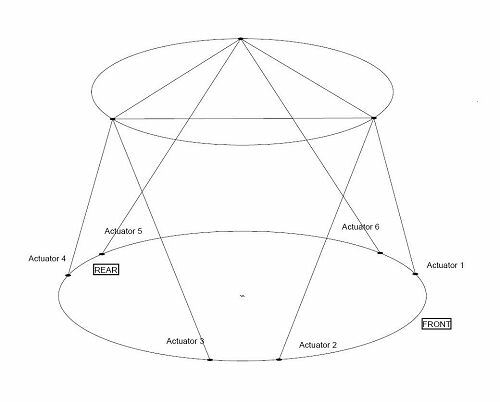 The real physical geometry of the platform actuator arrangement is defined in the .bff configuration file - see section 4 for more details. This physical model is used internally by the motion driver to relate output DOF movements to individual actuator extensions. The position demand output from the motion driver can not be used to drive electric motors directly. This requires speed and direction demand outputs. This normally requires separate closed loop servo drive hardware/software.